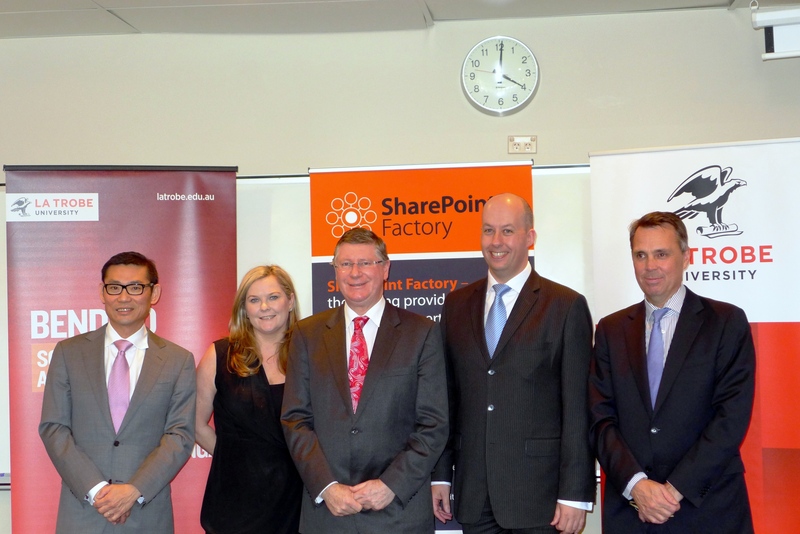 SharePoint Factory announced the exciting launch of its first Australian initiative on Monday 26 August, in collaboration with Microsoft Australia and La Trobe University Bendigo Campus, and supported by the Victorian Coalition Government. The new ICT capability will be established at La Trobe University in Bendigo, Victoria, connecting industry and organisations to Latrobe University interns, creating more than 150 jobs for the region. The Premier of Victoria, the Vice Chancellor of La Trobe University and the Managing Director of Microsoft Australia joined Kee Wong, Managing Director of SharePoint Factory at the launch highlighting the importance of the initiative for Victoria, Australia. “SharePoint Factory will not only create a number of high value jobs in Bendigo, but will help increase the number of students enrolling in ICT courses to meet Australia’s demand for a future driven by the digital economy,” said Kee Wong, managing director, e-CentricInnovations. “Microsoft SharePoint skills are highly sought after not only in Australia, but also across Asia and globally; as such it excites me to be involved in creating an export opportunity based out of Bendigo. “The partnership with Microsoft Australia and La Trobe University, along with the support of the Victorian Government is testament to the important contribution ICT continues to make to the local economy. “We look forward to watching young people in Bendigo grow into successful ICT business leaders of the future, and to rolling out similar partnerships in regional cities in Australia, Malaysia, Indonesia and beyond,” Mr. Wong concluded.